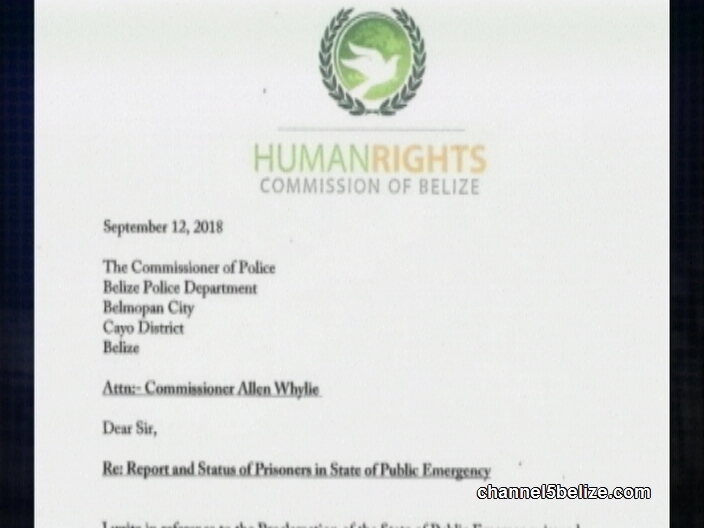 The Human Rights Commission of Belize late this evening issued a letter to the Commissioner of Police, seeking a report and status of prisoners held as a result of the State of Public Emergency. The Commission says that along with the Bar Association of Belize, it has been monitoring the implementation and the legal progress of the exercise of the powers of the state resulting from the proclamation. The H.R.C.B. seeks information on five matters, including on the required naming of an Emergency Powers Review Tribunal to be appointed by the Chief Justice from members of the legal practitioners. The H.R.C.B. also seeks confirmation on the condition of each prisoner held under this proclamation, the status of notification of the particulars of the provision of law under which each detention is authorized and the mechanisms to safeguard against arbitrary breaches of the rights and freedoms of the detainees. The Commission states that the temporary suspension of rights is not license for inhumane abuses. It also notes that the Constitution establishes detention for not more than a month, which is contrary to statements made that the purported gang members can be held for more than a month.